Early one morning my Maasi guide discovered a lioness and her two cubs. She was protecting her wildebeest kill by hiding it under a large tree. On the second day we saw a large male walking in her direction. This was dangerous. The male lion often kills the cubs so he can mate with the female and start his own family. Or, he can demand the kill and won’t let her eat. My guide positioned the jeep close to the lioness before the male arrived. The lioness and her cubs looked intently at the male as he walked over the hill. He came closer and closer – what was going to happen? Was there danger? The male looked around and with a big yawn, flopped down and fell asleep. Then to my surprise a little cub started to stalk the male. The male woke up and swatted the cub with his huge paw – then went back to sleep again. This was the father of the family, so there was no danger at all. The little cub lost interest in his father and sat in the shade of my jeep. He was adorable and I took so many photographs. 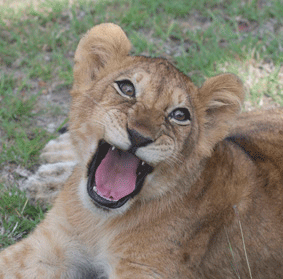 He was my favourite little lion cub with his happy face. One evening when I was dining with the camp manager we heard a loud bang, followed by the sound of scrabbling hooves on the wooden deck. The manager unzipped the canvas and to my horror I saw a lion chasing a wildebeest right through the middle of the dining tent. 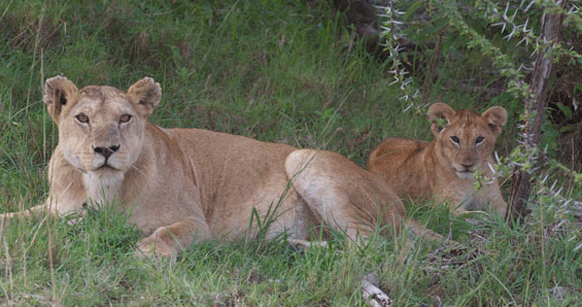 I was so frightened I didn’t know what to do – and how could I get back to my tent with a pride of lions around the camp? For my safety, two Maasi walked with me, their torches swinging around in the dark. 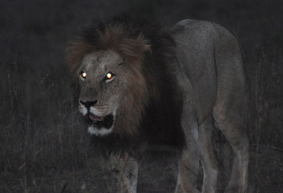 I saw two lions on my left and one just beyond my tent, his eyes glowing in the torch light. I nervously asked, “Is it safe?” and the Maasi replied, “Yes, because you are closer to your tent than the lion.” Oh, great!!! Trusting my life in their hands (and the desperate need to run) I reached my tent and I was safe.